Here you find a collection of track- and pit lane commands. Commands do add functionality to track and pit lane. They do "belong" to track- or pit lane sectors. In a TE (trackeditor) select a track- or pit lane sector and You see the commands that do belong to it. We do refer to those cmds basically by their hexadecimal number 0x80 .. 0xee. They are listed along their number with more or less description of meaning and arguments. The library is not yet complete, but hopefully one day it will be. You are all invited to verify, correct and/or extend the descriptions you find here. If you do, please prooved by examples, so i can verify it. And every idea of making this document more usuable is welcome also ! If you look at the command library for the first time, you may want to have a look at the glossary first to get explanations on some "common" terms and abreviations. I would like to ask everybody to use those terms, so communication may become simplified. To anchor an object setting at the centerline of the track. Objects (e.g. house, bridge, Advert etc) are defined in so called object shapes (formerly known as "internal objects"). In the trackfile You find a list of object settings (formerly known as object definition). In each of these object settings you specify which object shape you want to use, then you set up where and how it should show up relative to the track center line. With cmd 0x80 You finally anchor the object by placing an object setting. In cmd 0x80 You refer to the object setting by giving its "offset" within the list. The TEs show this offset in the list of object settings. The view distance in Granprix2/3 means how far away from the viewers position the track scenery and objects and everything still shows up. The view distance is strickly defined along the track and does not take care of the layout of the track. This means if the lanes are crossing (like e.g. in Suzuka) the other lane is not visible anyway, if the distance along the track is too big (as it is in Suzuka). On the other hand, the distance perpendular to the track does not matter. So the view range must not be imagined as a circle, as e.g. the PHTE implies ! The default view distance is about 60 track length units ahead and backwards. By the cmds 0x81, 0x82, 0xbe and 0xbf. You can increase this distance. But if You move on on the track the view distance decreases again until you are down at about 60 or until You increase the view distance. E.g. if you set the view distance to say 200, then move on some 50 units, then the actual view distance there is some 150 yet. Please think about this before going on. Its important to know how this works ! If you also want to extend the view distance for verges, fences and banks, you have to insert 0xbe and/or 0xbf instead. And if you want to go beyond a range of 255 you may need to work with cmd 0xc5. For detailed descriptions of the meaning of the cmd and the arguments please have a look at the cmds 0xb4 and 0xb5. With these two cmds the pitlane is attached to the track. The beginning of the first sector of the pitlane is attached to the beginning of the track sector including the cmd 0x86. The end of the last pit lane sector is attached to the beginning of the track sector including the cmd 0x87. see pit lane guide for the details. Not used anymore in original tracks of GP3 ! They are replaced by cmds to map jips. These descriptions are maybe a bit brief, but you will know what i mean, when working with a starting grid, respectively pit lane markings. It looks like the same type can either be inserted in the track OR in the pit lane. Not used in original tracks of GP2 nor GP3; no noticeable effect. As soon as all track sectors have their checkboxes checked, and kerb type selected, You can specify the kerb with one of these cmds. If length is greater than the tracksector, the kerb-checkboxes in the next sector also have to be checked. There are several types of kerbs, A and B in GP2 and A and B for left and right side each in GP3. 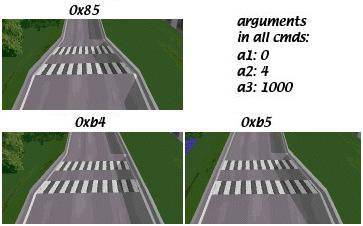 see cmds 0xca and 0xcb for defining the shape of those kerb types. "When setting a 0x8e or 0x8f command, this command applies to the rest of the track, or until another 0x8e or 0x8f command is found (not just one kerb). When you apply a kerb before a 0x8e or 0x8f command is given, GP2 will use a 'default' command with a2=1 and a3=12." Pretty vague. In original tracks you often find this cmd before "dangerous" corners or hairpins. After tests with the notorious first corner of Bern-Bremgarten I came to the conclusion, this cmd could make the cc-cars to keep more distance to each other ! It could be e.g. viewed in the hairpin of adelaide and in mirabeau of monaco. The horizons split into different pieces, 2 vertically and typically 14-ish surrounding the track horizontally. The lower jams are smaller than the upper horizons - with this cmd you can alter the texture of the lower ones. Its sort of a new fix for the no-mans land under the horizon, looks pretty messy w/ them all removed. If you'd like to check delete them all in any track, or change all of the arg 3 values to a distinctive texture id. I can't guess why these are treated so differently from the upper horizon w/ 0xcc, other than its a new cmd for gp3? Still pretty vague. They seem to influence the cc-cars. When looking at the original tracks you notice the value for the outside of the corner is usually small (1 or 2), for the inside of the corner, the value is greater (4 or 8). So we could say the value is similar to the theoretical space between cc-line and border of the track. Or maybe better "the safe space" along the cc-line. I made tests with the notorious first corner of Bern-Bremgarten, where normaly chaos happens after a start of a race. Maybe its a coincidence, but after setting both values to 1 before the corner the number of accidents decreased significantly, although i could not really recognize different behaviour of the cc-cars. Maybe they have become somehow more careful or at least less fragile !? note: "speed limiter on"-cmd must not be in the same pit lane sector as "pit lane fences begin" cmd 0x9f. 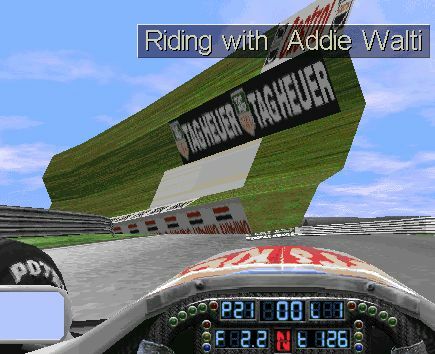 else gp3 may crash back to desktop at loading the track. The new height value will be set at the beginning of the track or pit lane sector including one of these cmds. The whole preceding sector will feature a transition height from the old to the new fence height. Looking once again at the cmds 0x98/99 we also can say it like this: a2 is simply a index to a table of height values: 1=200; 2=400; 3=600; 4=800; 5=1000; 6=1200; 7=1400; 8=1600; 9=200 (again); etc. As found by Filou, cmd 0x9a lets you specify a custom value for one of those standard height values. By e.g. inserting a 0x9a with a2=2 and a3=1800 the inserting of a 0x98 with a2=2 does not give a height of 400 anymore, but a height of 1800. If you want to change a left fence standard height then you refer to the table with the indices 1 .. 8. If you want to change a right fence standard height, then you refer to the table with the indices 9 .. 16. So if you want to repeat our example with the right fence you insert a cmd 0x9a with a2=10 and a3= 1800. If you define a new height value with 0x9a, this value is changed globally. Even in the pit lane. You also can insert the 0x9a in the pit lane and it counts for the track also. In GP2.exe there seem to exist a slot-specific value that defines how far away from THE VISIBLE pit lane-beginning, the cc-cars start their pit lane-approach. Not used in original tracks of GP2; no noticeable effect. 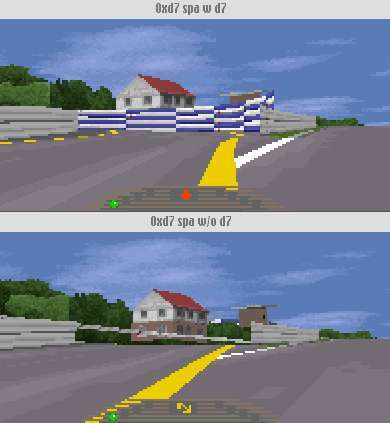 But even if the visible part of the pit lanes ends before the actual end of it, the computer cars do not go onto the racing line until the actual end. this cmd is included in the first pit lane sector with its own fences. used to initiate the connection of pit lane fences and track fence. kind of marks the beginning of the "pit lane world". this cmd is included in the first pit lane-sector in the "track world" again. its the first pit lane sector without its own fences anymore. not used in original tracks of GP2 and GP3. SDI "seems to affect the processing of the next command"
GP3: here not every track includes one of these ?!?! not used in original tracks of GP3. this parameter is not used in the original tracks of GP2. it also seems not to be finished there. But in GP3 its included ! a3: Amount Of The Banking; + is for left banking, -ve for right banking. 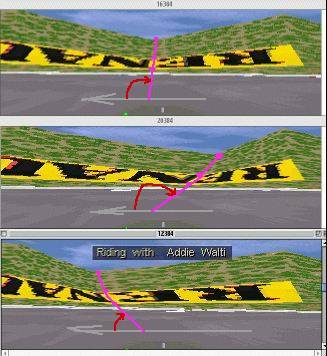 dJomp: This command seems to move the yellow pit lines to the side of the track, so the whole line is visible. 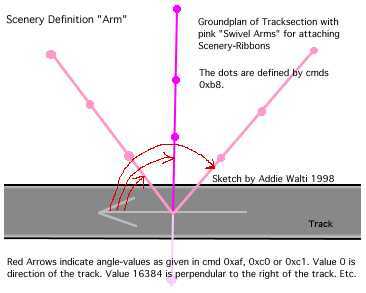 This cmd defines position and angle of a pair of swivel-arms for the scenery-ribbons, one for the left side and one for the right side of the track. The cmd 0xaf is always paired up with a cmd 0xb8 in GP2 or a cmd 0xee in GP3 that defines the x- and z- coordinates where the scenery-ribbons are attached to the swivel arms. In a single track-sector there can also be several pairs of 0xaf/0xb8 (0xaf/0xee respectively) with different offsets in cmd 0xaf. See the following pictures for an example. All three screenshots feature exactly the same clip of a certain part of a track. The view is perpendular to the track to the right side. There are three "arms" visible. One at the left side of the picture, one at the right side and one in the middle. The only difference in the three images is the angle value of the middle "arm". In GP3 not used anymore, possibly replaced by one of the cmds 0xa - 0xed. For switching them on in GP2, use 0xb9 or 0xd9. Do ONLY insert this cmd at the same position (tracksector AND offset) as a 0xaf/0xb8, 0xc0/0xb8 or 0xc1/0xb8 pair. (see original tracks for reference). NEVER have it alone. If you do, gfx bugs of the strange kind may happen. set bit 1 to turn off left boundary line. set bit 2 to turn off right boundary line. Its three times the very same section in a track. The first crosswalk marks the beginning of the tracksector including the track width change cmd. The "Length" of the crosswalks are 1 each. The width before the change is 1800 on both sides. It does not matter what value is set in a1, the change of width always starts at the beginning of the sector including the track width change cmd. Transition is not limited to the starting sector, its possible over several sectors. If You have small figures for the track-width this also affects the verge width. The inital (symmetrical) track width is set in the track config section, though the PHTE does not show it. But the IHTE does. For detailed calculations of track and verge width, see formulas of Robin de Paus in the Appendix. Default pit lane width seems to be 640. You can change the pit lane width the same way as the track width. e.g. inserting a cmd 0x85 in p0 with offset 0 and transition length 0 to have immediately the new width. But as the pit lane ends are attached to the track in a special way, you will notice an undesired effect. The centerline of the pit lane seems to be connected to the track at a lateral distance of 640 off the appropriate track side, independant from track width! So changing the pit lane width with cmd 0x85 will shift the yellow (pit lane) borderline away from the white (track) borderline. But cmd 0xb4/b5 will do the job perfectly. If you have right side pits, use cmd 0xb4 [sic! ], et vice versa. When checking out this subject you also may want to keep your eyes on the cmds 0x9b at the entrance and the cmd 0x9e at the exit and the general pit lane layout problems. Vaino: (for GP2) I tried this command first at track (t01) and then at first sector in pitlane (p00). There were no visible difference. I found that positive low values turn pitlane start angle to left and negative to right. My pit was on the right side. Vaino: (for GP2) This height value is very strong. Value 10 gives about 20 degrees. I don't know more yet. Maybe this cmd is used to somehow compensate effects of banking ?! 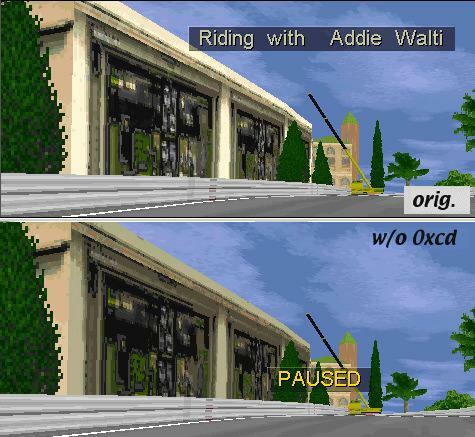 For GP3 the scenery structure functionality is moved to cmd 0xee. Origin of x- and z-coordinate is the middle of the track (if You have symmetrical widths). This is the famous scenery-ribbon-cmd. It defines the basic scenery, together with the swivel-arm-cmds 0xaf, 0xc0 or 0xc1. You have them allover the track and alltogether they define the shape of hills, forests, meadows, dunes, whatever. The maximum number of cmds 0xb8 seem to be 128. If you insert another one, the very last of them in the track gets lost. As mentioned you never see the cmd 0xb8 standing alone, there always is another cmd BEFORE it, a cmd 0xaf, a cmd 0xc0 or cmd 0xc1. The latters do define the position and some angles, and 0xb8 defines the structure of the scenery. See also Scenery Tutorial of Martijn Keizer. In GP3 not used anymore, probably replaced by one of the cmds 0xa - 0xed. martijn: "With this cmd you can "turn on" individual ribbons and/or banks depending on the value in argument a2. The ribbons are showing up no matter what detail level is set in the game (in opposite to 0xd9)"
Not used anymore in original tracks of GP3. a6 and a7 could be used if You want to use only part of a texture. There is a limit for the number of cmds 0xbc in a track. 221 cmds work, but more could fail. PLK: "a2 is definitely a rotational value. The sun in Portugal has a value of -3640. In the track I'm working on now, objects which face me while I exit the pits where in deep shadow. I changed the value to -18640, and the sunlight had turned around (anti-clockwise) to light up these objects." For a brief introduction to the subject "View Distance" please have a look at the old view distance cmds 0x81 and 0x82. If you insert a cmd 0xbe or 0xbf and set a3 to a value smaller than 60, the view distance remains about 60. If you set a3 greater then 60, the view distance gets increased to the specified value. If you set a3=100 the view-distance is 100 track-length units. In opposite to the old view distance cmds 0x81 and 0x82 you can define what should show up in the extended view distance. With a2 you can do this. It looks to me like you only need these two cmds to set the view distances. But in the original tracks these cmds are always inserted together with a cmd 0x81 or 0x82. IF they are inserted as a pair ALWAYS the view-distance is set by the old cmd 0x81 or 0x82 and the location is set by the new cmd 0xbe or 0xbf. This means a3 of 0xbe gets overridden by a2 of 0x81 and a3 of 0xbf gets overridden by a2 of 0x82. If you want to go beyond a range of 255 you may need to work with cmd 0xc5. These cmds define position and angle of a single swivel-arm for the scenery-ribbons. For detailed description of the meaning of swivel arms, see cmd 0xaf. The x- and z- coordinates of the scenery-ribbons are defined in the cmd 0xb8. According to Rene "SDI" Smit the cmds 0xc2, 0xc3, 0xc4 and 0xba all call the same function within gp3.exe. The only difference is a4, which is hardcoded in all cmds except 0xc4. Using one of these four cmds automatically inserts dummy scenery arms up until the next real swivel arm cmd (pairs of 0xaf/0xee, 0xc0/0xee or 0xc1/0xee). 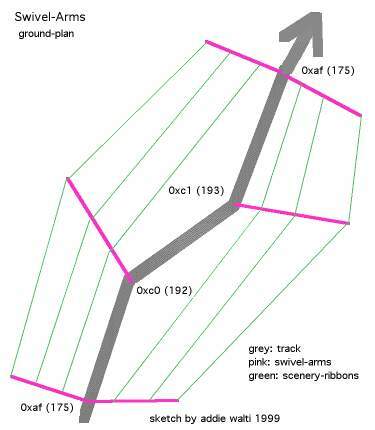 Args a2 and a3 define the spacing of the dummy scenery arms, and arg a4 dictates which ribbons are pinned to them. The smaller the values of a2 & a3, the smaller their spacing and so the better the ribbons follow the layout of the track. However a value of zero does not space out the scenery arms at all, and so there is either no effect or a previous effect is switched off in that plane. Without 0xc2-c4 or 0xba the ribbons go straight from one swivel arm to the next, causing a mess around corners or up & down hills. The cmds 0xc2, 0xc3, 0xc4 and 0xba all call the same function. The only difference is a4, which is hardcoded differently in all cmds except 0xc4 in which it can be specified. With cmd 0xc2 all the ribbons on the left side of the track are affected; with 0xc3 all the ribbons on the right side and with 0xba all the ribbons on both sides of the track. These dummy arms are strange in that it seems you can choose to attach a ribbon's DFC value but not its Z value & vice versa. Also they are not "swivel" arms because their angle cannot be adjusted, hence named scenery arms. And with cmd 0xc4 some ribbons can be attached and others not. 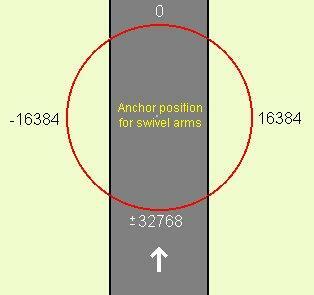 The track length to affect is defined by the distance to the next real swivel arm(s) minus the offset in a1. The number of dummy arms inserted is defined by their spacing. The shape of the scenery structure as set by 0xee is averaged equally between the two real swivel arm cmds; it's unaffected by these four cmds. To define view distances beyond the regular 255 as set by 0x81, 0x82, 0xbe and 0xbf. In some tracks cmd 0xc5 features 7 args in other 8 args. This is set by a switch in the track config section. See c5c6 guide for the details how to change this switch. With 0xc5 you define what part of the track should show up in the distance. And with 0xc6 you define in what part of the track this section should show up. With this cmd you set a default texture on a location according to a2. Please have a look at the following sketch. It features a cross-section of a kerb at the right border of the track. Low values make horizon smaller, high values bigger. If used 0, there is no horizon. And 1280 (or near) dublicates the size of horizon." a4: Light Up Or Darken Factor; 0 (dark) .. 15 (bright). In this example the cmd 0xcd is used to lighten up the frontwindows of the Hotel Massenet. Or in technically terms: to lighten up the texture on ribbon 4. Not used anymore in GP3 original tracks. SNQQPY.DOG: "It occurs only once in f1ct04.dat, Monaco. It appears in t68, the sector just before the tunnel. Its argument is (4). Removing it caused the tunnel roof section bleed through the right building wall as seen from portier corner." SNQQPY.DOG: "It always appears in track sectors before the start of the pits. Usually at some distance. However the second argument always covers the whole of the track upto or just beyond where the pit fences begin. My conclusion is therefore to allow the pit building and pit objects to be seen at a distance through the pit fences but not through the track fences. Its use appears to be to allow objects to be seen through or across fences. Aside from this observations it would appear as a bug if used in the wrong place." With this cmd you can stabilize scenery. Typical instabilities result in flashing and shifting/warping of textures on fences, banks and ribbons. First you have to identify the part of the scenery that is to stabilize. 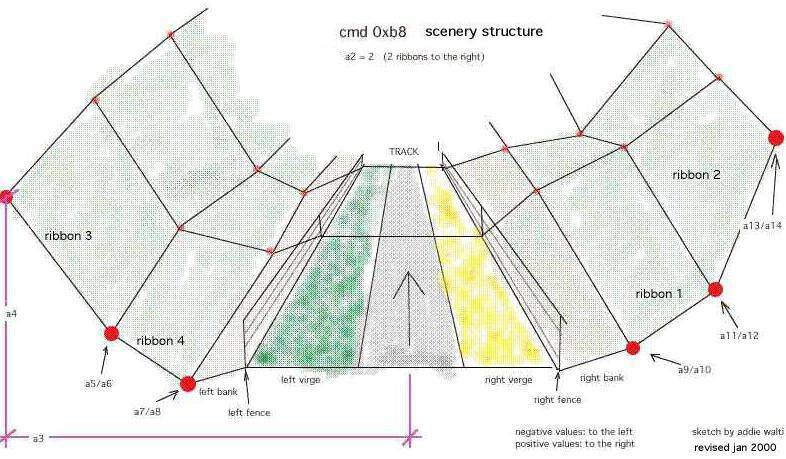 Typically its an area between two swivel arms (banks, ribbons) or within a tracksector (fences etc.). Say you have a flashing texture on the left bank between two swivel arms. Now you can try to stabilize it with 0xd0 located between the two swivel arms. You may want to start with a single 0xd0 in the middle between the two arms. If it does not yet workout, you may want to insert more of them with smaller gabs between them. Shifting of textures is a bit more subtle. You can see it best e.g. in forests. When driving through a forest, sometimes you see the trees-textures shifting away from you and then back again. 0xc2, 0xc3 and 0xc7 seem to be somehow related to 0xd0. SDI: "related to pit lane fence begin"
If you use this cmd at the entrance, you also have to use cmd 0xd6 at the exit, et vice versa. This cmd works similar to cmd 0xd5, but with unlimited view distance. 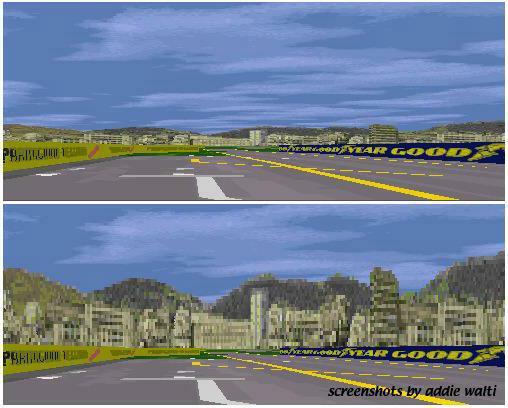 As soon as you pass this cmd, all pit lane is visible. f1ct12 (Monza) is the only original track where you see from the exit "through" the pitlane to the entry. Thats why this cmd is used but there. If you use this cmd at the exit, you probably also have to use cmd 0xd4 at the entrance, et vice versa. Paul Hoad: "it simply stores the position of the sector in which it appears which might mean that it may be trigger for something." This cmd works similar to 0xb9, but ribbons enabled with this cmd do follow the detail level settings of the sim (key D). They show up only at medium and high detail level anymore. And they remain textured regardless the settings in the gfx setup. This may be useful as soon as you shape buildings with ribbons. In GP3 not used anymore, probably replaced by one of the cmds 0xea - 0xed. 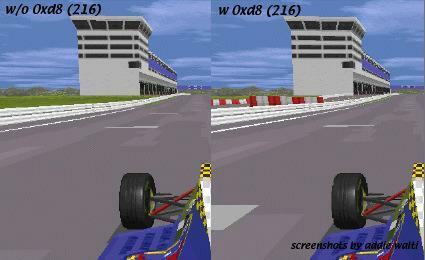 If you want them showing up no matter what detail level is set, you have to use 0xb9 instead"
Cmd 0xdb defines the sequence of drawing track- and pit lane scenery gfx. This cmd can be found (only) in the original Spa-track f1ct11.dat in t0. In spa you have a hairpin immediately following the s/f straight and after that another straight (towards eau rouge). Enclosed in these two straights there is the pit lane, the pit building in particular. 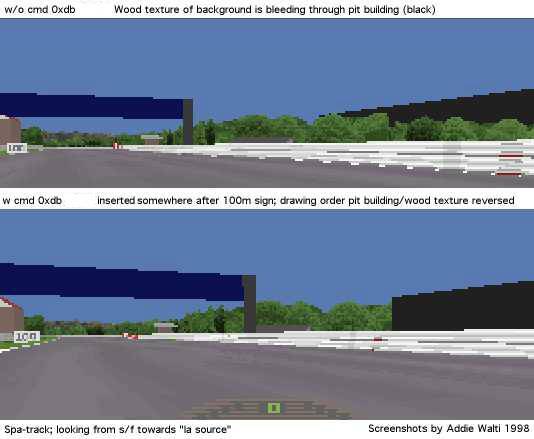 It seems like the gp2.exe normally draws first the pitlane scenery, then the regular track scenery (covering appropriate part of pitlane scenery and objects). So in our case the trees of the right side of the straight after the hairpin would become pasted over the pit building. but here comes 0xdb. Cmd 0xdb seems to tell the gp2.exe to switch the sequence of drawing there. its parameter seems to be (once more) an offset into the sector. So with a cmd 0xdb, the gp2.exe first draws the regular track scenery beyond 0xdb, then the pit lane scenery, then at last the track where you are standing, if you are standing before the cmd 0xdb. You can check this easily by removing the cmd 0xdb in the original Spa-track and then have a look at the pit building, standing in the middle between s/f line and hairpin. PH: "it simply stores the position of the sector in which it appears which might mean that it may be trigger for something." 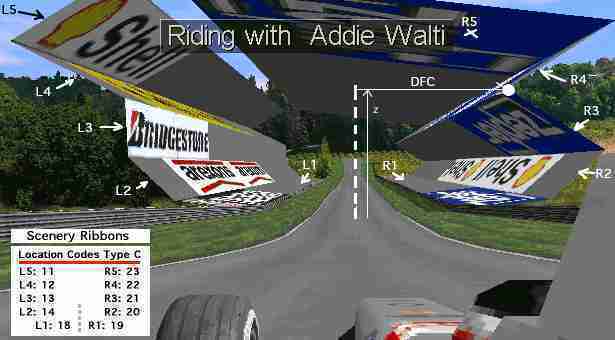 Not used in the original tracks of GP2 and GP3. With the second argument of 0xd2 you can set up the grip level. MK: "a2 is grip level. "normal" is 16384, if you want mega-grip, use 32767 (loews hairpin in 5th), if you want to try GPL, use around 11000. An icy condition is around 4000, almost zero drivability." MB: "0xdd is an evil cmd :) gp2 crashes when placing it in a pit sector and in a track sector it makes the car jumping in the pits." To define black flag areas. In original tracks they are always inserted in t0. With this cmd you set the shadow-zone e.g. under a bridge. In wet weather this is the zone that remains dry. Thanks to John Verheijen for this one. 0xe1 - 0xe5 were not used in GP2 original tracks; they had 1 arg and when inserted there was no obvious effect. These sister cmds allow an instant fence height change, and for 2 textures to be mapped vertically above & below each other on one extended fence (w/ 0xe9) - for creating billboards on top of the normal fence or just one extended ad. Comparing the differences in multiple 0xe9's at the same offset & loc. code could give the remaining unknown 0xe9 arg(s)? BTW when i was trying to find a value for both fence sides it removed the left verge, went transparent so maybe there's more to these cmds, prob just a bad side effect though. Not used in original tracks of GP2 and GP3; in GP2 they all had 1 arg; no obvious effect. see also workshop of dJomp on the workshop-page of TEIC for more explanations on this cmd. a5 Position of start of repeat. Argh, difficult to explain: see http://www.selby16.freeserve.co.uk/gp31.jpg for a reference. This was created with a huge track width, a5 = -128 and a6 = 1. The dash at the left is 128 'units' to the left of the center of the road. Then, 256 units to the right, it repeats. Really difficult to explain this! A start line may have a5 = -128, a8 = 4 but the zebra crossings in Monaco have a5=0, a8=8 a7=32. a8xa9 = 256. ie. covers whole of repeating area. then putting a dash at a will put one at b,c too. But 256 'units' is a track width of about 1792 (x7). Having said that 0 is center of track, 128 is used in the pitlane as the left side of the road. a9 distance from start of first jip to start of second jip etc. So if jip width = 32, a9 = 16 will only show the second half of the second repeat. GP3 version of GP2 cmd 0xbc. though slightly different arguments. a3/a5 a3 brings us an alternative way of repeat the texture, though it also shifts it sometimes. Say we have a mapping length (a9) of 10, and we set a3: to 5, then we get two textures mapped. This is valid if we have set a5: 1. If we have set it to 2, we get 4 textures. We see the offset given by a1, and the length of the mapping given by a9; We have set a3= 5 to see the repetition AND the (false) shift of the textures. If you look carefully you notice the texture is shifted to the left. In case you're in doubt you may want to check out sil_ads4.jam. This unwanted shift seems to depend on the rotation. If you have the same example with a8=3, there is no unwanted shift! We also had doubled the "vertical resolution" by setting a6=32. So we actually mapped a texture with double the height than our selected texture 1219 has. And because the texture below 1219 in sil_ads4.jam does not have the same palettes, we have color distortions. However this seems to happen only in my system. In other systems the "vertical resolution" argument seems to work as expected. Good to see is the vertical shift given by a7=16. It shifted the texture upwarts, so the upper border of TAG HEUER is cut. After having been faced so much trouble we want to have a look at how we probably want to look it like. We see a perfect mapping of the texture 1219 twice (because of a5=2) on ribbon r22. If the reader now thinks theory of relativity is easier to understand than this, i agree. I'd suggest to set the args as mentioned in the 2nd example and rotation along the values mentioned above to have an easy start. If you are brave then you may go on with your own experiments, to see and understand. a8; we mentioned the "common" values 3, 19, 35, 51 etc. they are the same as in GP2. but in GP3 we also see different figures like e.g. 81, 113, 32769, 32801 on the verge locations 37-40.
a10: horizontal shift. this is e.g. used with texture ID 999 of ULine_64.jam in f1ct11.dat and others. with a10 you set up what clip of the long texture you would like to see mapped. Thanks to all the people who brought pieces of information to me ! These cmds switch on and off one or more ribbons. Do switch ribbons only in the same place where swivelarms were. For swivelarms see cmd 0xee. in gp2, the 0xd9 (217) cmd turned on ribbons that would not show when the game was run w/ the detail turned down in the graphics menu. to have ribbons showing up no matter how reduced the detail in the options, you switched them on with 0xb9 (189) cmd instead. in gp2 0xb0 (176) was used to turn off ribbons that were turned on by both 0xb9 and 0xd9. in gp3, ribbons turned on w/ 0xea (234) always show in low detail mode (so its the old 0xb9, 189). Those turned on by 0xec (236) recognise low-detail mode and so do not display (so its the old 0xd9, 217). so if this is right, there seems to be two different pairs on/off switch systems. my question was, has anyone found a positive difference between cmds 0xeb and 0xed? or as a relative newbie, have i got the gp2 cmd functions wrong? Works basically similar to cmd 0xb8 in GP2, but with more ribbons, 5 on each side. The first ribbons are attached to the bottom of the fences. The second ribbons are attached to the first ribbons, etc. There is no more "Ribbons To The Right"-argument anymore as in 0xb8. We always have 5 ribbons on each side. So lets call them L5, L4, L3, L2, L1, then R1, R2, R3, R4, R5 as sketched in the image. On the panel in the image we also see the corresponding loc codes type C.
In the image we also see the "point" that defines R3. We see what is meant with DFC (distance from center) and z. Thanks goes to Woody for research and Fat Rat for labels. 0xff is said to mark the end of track data in the trackfile. A lot of cmds do have a parameter saying how far from the beginning of the sector the cmd "happens". Sometimes this parameter is also refered as "Start" or "Length Into Sector". The offset is not limited to the sector, where the cmd is included. E.g. if the length of the sector is 3, the offset could be e.g. 8, and so the action takes place in one of the next sectors. sometimes you see a question mark in front of an argument descriptor etc. (e.g. "?Location Code Type B"). This means there are indications for this argument being what it is labeled, but its not really confirmed yet. 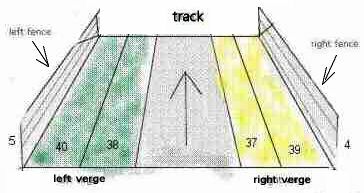 At first place the tracklayout is defined by its centerline. Lots of arguments of cmds do refer to this centerline. Therefor a DFC value means the distance of something perpendular to the track, to its centerline respectively. There are several units for this value. The centerline is not always in the middle of the road. This depends on the track width settings, that can be asymmetrical. Other arguments refer to the distance to the start/finish line. The unit for this value is16 feet equals 4.8768m most of the time. Several ribbons along the track on both sides do form the scenery. Their shape is determined by track commands. A sector is the smallest piece of a track in a trackfile. A sector has constant curvature- and gradient change. Its length is measured in a unit of 16 feet (4.8768m). In order to keep things simple and short, I use the abbreviation t for track-sector and p for pit lane sector. So t17 means track-sector 17 and p13 means pit lane sector 13. GP2/3 internal unit that equals 1 track length unit (16ft; 4.8768m). With verge we mean the space between the track and the fences. 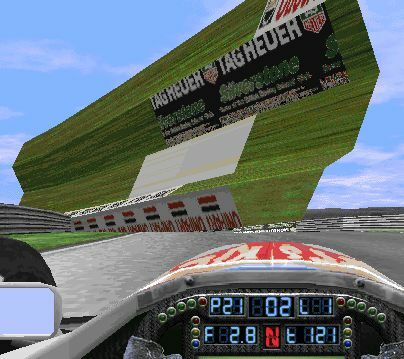 In the early days of trackediting for GP2 this was also known as "bank". But order to unify the terminology in track-editing with the terminology that is used in GP2 we introduced the term Verge. This labels the space between the fences and the first ribbons. Not used anymore in GP3. There it does not make anymore sense to make a difference between banks and ribbons. 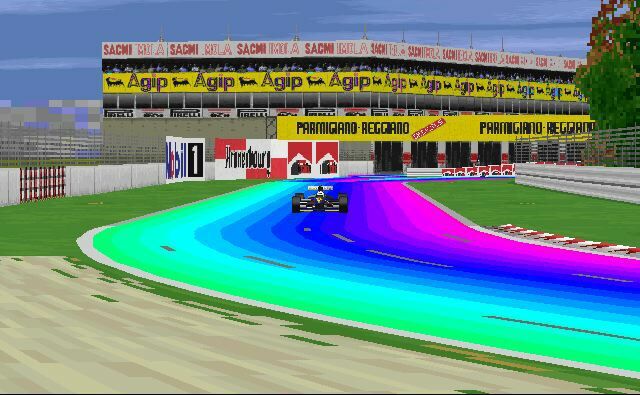 The last few terms will now be visualized in a screenshot of the GP2 Jerez-track. To visualize the meaning of the term "bank" i switched off all textures, except those on the banks. In this screenshot on the right side of the track we dont see the ribbons. So far we have yet the GP2 codes here most of all. Chances are good they match GP3 also in a wide part. Location Code B3 is for sure meant for the ribbons only. Left and Right is for sure also. Same to L1 and R1. Thanks Rene Smit and Woody. Big positive numbers, e.g. 65438, also could be a low negative number: in computer programming everything is stored in bits and bytes. A typical storing-unit is two-bytes (16bit), also called word (in a 16bit environement). In such a word you can either store a number 0..65535, that means 2^16 (2 power 16), such a number is called UNSIGNED or CARDINAL. Or it can be stored as a so called INTEGER number, -32768 .. +32767. But its the same two-bytes, its just a matter of interpretation. That means a certain number, say 65000, could be interpreted as UNSIGNED 65000, or as INTEGER -535; same two-bytes, different interpretation. So if an argument of a cmd has typical values 0..1000 and 64535 .. 65535, this actually smells like INTEGER: 0..1000, -1 .. -1000. Here the calculation: 0..32767 its the same INTEGER and UNSIGNED; 65535 downto 32768 you have to interpret as -1 downto -32768, calculation: integer:= unsigned-65536. At load time the track gets "compiled" into an internal format. This compiler passes several times. Not all commands are processed in the same pass. -nov 4, 2000; cmd 0xe1/e2 correct loc codes now; thanks john! -sep 15, 2000: 0xb7; removed extension by woody, as it (according to woody) prooved to be wrong. -aug 30, 2000: more rework; "long list"